How familiar are you with Edd China? The English television presenter, Edd China, is admired for having many different talents. This is because, apart from being a talented TV presenter, Edd China also a motor specialist, an inventor and a genius mechanic. Over the years, he has thrilled TV viewers in England with his skills at fixing broken cars and creating his own brand. As a TV star, Edd is now most popularly known for the roles he played on Wheeler Dealers, a Discovery Channel’s television show where he served as a presenter and mechanic. He has also featured on other top TV series like Auto Trader and Scrapheap Challenge. Edd attended the King Edward’s School, a co-educational day and boarding school located in Witley, a town in Surrey. When he graduated, he went on to attend the London South Bank University from where he graduated with a degree in engineering product design. Edd’s interest in mechanics and cars was very profound that even while he was still in university, he invented what he called the Casual Lofa. The Casual Lofa is a seat that can actually be driven around like a car. The invention caused quite a stir around England and brought him wide acclaim. After he invented the Casual Lofa, Edd made a lot of waves In England and soon landed a television job in 1994 when he was hired to work behind the scenes as a special effects technician on Father Ted, a popular sitcom. About four years later in 1998, Edd China made his first TV appearance when he featured as a guest on Top Gear Live, a TV program in which he drove his the Casual Lofa to the amazement of the crowd at the Silverstone ‘Live Arena’. Edd continued appearing on other TV shows, garnering more fans who adored his work. He has appeared on Channel 4’s The Big Breakfast in which he was seen riding his invention, the Casual Lofa. He also featured as a guest on the TV show, Scrapheap Challenge and This Is Your Life. He has also thrilled fans by delivering Michael Aspel, one of the most popular English TV presenters, to the television studios while riding on the Casual Lofa. In 1999, Edd China worked as a resident designer on Panic Mechanic and then appeared as a guest on ‘Build a Bond Car On A Budget’, a Top Gear Live feature in 2000. During the show, he showed off his genius car modification abilities on the Rover 800, a car purchased at £200 and then modified to look really exquisite with just a £100 worth of ejection seat and other budget Bond-esque gadgets. Having become a very popular Englishman, Edd appeared as a celebrity guest on Ready Steady Cook, a BBC show and then went on to co-host Auto Trader, a rather short-lived television series. Edd’s biggest break came in 2003 when Discovery Channel hired him to create and work as a presenter on Wheeler Dealers, a car programme which would later become very famous in England. Edd worked on the show alongside Mike Brewer, another TV presenter. The show became their biggest TV work ever. Why Did He Leave Wheeler Dealers? Edd China and Mike Brewer presented Wheeler Dealers together from 2003 to 2017 across as many as 13 seasons. During this time, they succeeded in making the show very popular in England. However, on the 21st of March, 2017 Edd revealed, via his YouTube page, that he has quite the show, to the heartbreak of fans. Explaining why he quit the popular show, Edd revealed that he had some disagreements with the managers over the direction of the TV series and so he had to leave. When Edd left the show, fans became very sad about the development and even went as far as threatening the life of his co-host, Brewer. Edd now features on his own series called Edd China’s Garage Revival which premiered on the 1st May 2018. He also posts regularly on his YouTube page where he boasts of hundreds of thousands of subscribers. Who Is Edd China’s Wife? 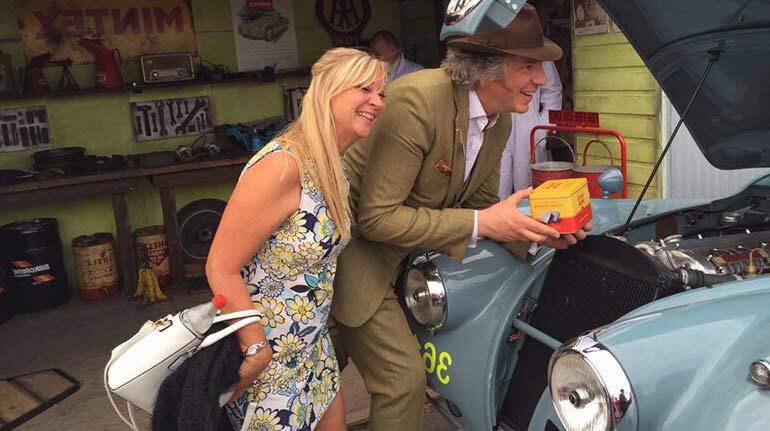 Edd China is a happily married man. The car connoisseur is married to a woman identified as Imogen China. Although information about the exact date and place where they got married is not available, the couple is obviously happy together. They have been seen together on many occasions at public functions and at other places including the supermarkets where they get to shop together. Imogen China is apparently famous because of her marriage to Edd but it is noteworthy that she is also a woman who has worked hard to make a name for herself in her own field. She has a masters degree in Business and Economics and has worked as the VIP relations manager at the British Airways London Eye. She has also served as the Director of Cummfy Banana Ltd.